A refrigerator, commonly known as a fridge, is a household appliance used to preserve food by cooling it to temperatures below the ambient temperature. The major components of a refrigerator include a heat pump and a separate compartment, which is insulated to prevent transfer of heat from the outside environment to the compartment and vice versa. Additionally, a refrigerator has other smaller components that require repair or replacement due to wear and tear. In order to prolong the service life of your refrigerator, you need to reduce the frequency of repairs and replacement where possible. To achieve this, you need to understand and practice various maintenance procedures. One of the most basic practices to help your refrigerator live longer is by maintaining cleanliness. For instance, residues from spilled food and drinks are sticky and cause the refrigerator door gasket to stick to the cabinet once there are such spillages. This sticking in turn leads to increased wear and tear of the rubber gasket, a flaw that can be prevented through proper grooming. When cleaning, both surfaces are cleaned using a mild rag and antiseptic. Secondly, cleaning the fringe’s condenser helps prolong the life of your refrigerator. In addition to this, keeping the condenser clean improves the equipment’s energy efficiency, thus reducing your energy bills. The condenser coils are located either at the bottom or behind the refrigerator depending on the model and year of manufacture. These coils should be cleaned a number of times every year preferably using a bottle brush or a feather duster. If a vacuum cleaner is available, it could also be used to clean the condenser. Alternatively you can choose to install a static condenser, which does not require cleaning. Another fundamental measure that will help increase your refrigerator’s life is by keeping it away from sources of heat such as stoves, ovens as well as direct sunlight. However, this may be difficult in some situations especially if your kitchen space is limited. In such circumstances, you can insulate your refrigerator using special curtains to protect your equipment from heat and direct sunlight. Besides, monitoring the level of the equipment would also prolong the life of your refrigerator significantly. The level is checked by placing a spirit level on top of the refrigerator and checking the position of the bubble. If the bubble is not at the center, adjust the wheels to conveniently lower or raise the fridge until it is level on all sides as well as diagonally. This ensures that the door is closed firmly to eliminate chances of air loss through the door. Many homeowners who live in areas where temperatures are mild invest in palm trees to enhance their property’s landscape. Fortunately, palm tree care is not difficult, provided the consumer follows a few simple tips. However, before selecting a palm tree, it is important to consider several factors. Most palm trees will not thrive in freezing weather, and even a very short duration of frost can put such trees in a weakened state and leave them susceptible to disease and insects. For this reason, it is wise for consumers to check with a local nursery if they are unsure whether or not palm trees will thrive in a certain area. Size is also an important factor when selecting a palm. It is not unusual for palm trees to reach heights of 50 or more feet. Therefore, one must be careful to avoid choosing a tree that appears small at the nursery, but will quickly grow to overpower the property when it reaches full height. When choosing a palm tree, it is essential to understand that sunlight needs are different among the various types of palms available. While some varieties are very sun tolerant, others thrive better in areas that receive partial shade.Water is also an essential consideration. Palms usually grow best in areas where the water supply is continuous and abundant. Therefore, those who do not live near natural water sources must ensure that their trees are watered frequently, particularly while they are becoming acclimated to their new environment. Watering frequency is determined by climate, average rainfall and other factors. However, in most areas, palms should be watered twice a month during the summer, and once every six weeks during cooler seasons. Bubble type or low drip watering over several hours is a better option than merely drenching the ground with a garden hose. As palm trees age, their older fronds turn brown and eventually die. Pruning off the dead fronds is a good idea, as it will keep the trees looking healthy and vibrant. Only dead fronds should be pruned and one should refrain from cutting too close to the tree’s trunk. Only a professional gardener should prune large palm trees. Finally, consumers should be careful when using gardening equipment and lawnmowers around palm trees, as their barks are easily damaged. 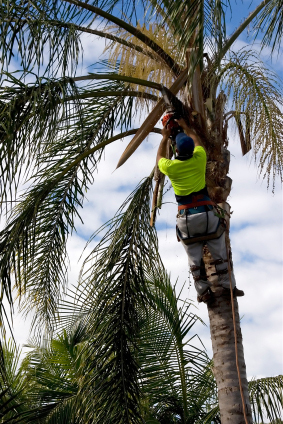 Following the palm tree care tips outlined above and asking for advice from a professional gardener when necessary are the best ways to ensure that such trees grow, thrive and add beauty and value to any property on which they are placed.